This bloom appeared to be a future flower. Upon close inspection Tom determined it wasn't a flower but a leaf growing to maturity. Yesterday, another trip to the ATM was necessary to gather enough cash to pay the four person staff of Dar Aicha the second half of the tips as we prepare to leave in two days. With local ATMs kicking out a maximum of MAD 2000, US $245.11 per customer more than one trip was required. We had MAD 2000 on hand from a trip a few days ago. ﻿As we prepare to leave we make a special effort to ensure that we don't have leftover dirhams making careful calculations important. We had yet to pay for five dinners prepared by Madame Zahra, including today and tomorrow, bottled water, tips and transportation to the airport. To accommodate all of these expenses, we needed a total of MAD 5300, US $649.54, leaving us enough for tips for the porters at the Marrakech Airport. This area was to my left as we dined at Le Jardin. The open courtyard with many birds flying about required we sit at a table with an umbrella to avoid getting bird poop on us or in our food. Of course, with the crowded souks we've always planned to have dinner and get cash on the same outing, although the restaurants and ATMs are not located in the same vicinity. This was especially the case yesterday when we were well aware of the hot weather. ﻿Adding the fact that I continue to wear a long sleeve shirt, long pants and socks, venturing outdoors in hot weather can be challenging. We decided to head out at 4:00 pm when I was suddenly feeling a need to eat when we hadn't had a morsel since dinner the previous night. The tasteful displays in Le Jardin are appealing. As we walked outdoors, the heat gripped us. It felt as if we walked into an oven. Thoughts flashed through my mind of the day we spent in Abu Dhabi a year ago this month while I was dreadfully ill and we'd visited the White Mosque. Entering the mosque required us to don appropriate clothing; for me, a heavy silky black abaya and for Tom a cool white thobe. The long walk that day from the parking lot to the mosque was the most scorching experience of either of our lives. ﻿Yesterday's walk was much further than the walk in Abu Dhabi but the temperature matched that day's unbearable heat. It was 108F, 42.2C! With low humidity in the desert, the heat was slightly more bearable than humid heat would have been at such temperatures. Another pretty self display in Le Jardin, where we've dined on many occasions while in Marrakech. ﻿Had we been able to stay within the confines of the souks, the long walk wouldn't have been as unbearable. But, the closed ATM was still not working leaving us with no option but to walk toward the entrance of the Medina where the other ATM was located, part of which requires a fairly long distance walking in the direct sunlight. I don't recall ever going for an hour long round trip walk, much of which was in the sun, wearing heavy fully covering clothing when it was 108F, 42.2C. I'm sure some of you may have done so when it was necessary under certain conditions. I commend you. Tom was wearing shorts and a lightweight cotton short sleeve shirt. It was brutal. A shelf was lined with various olives, a popular food item in Morocco. Once we arrive near the further ATM, Tom left me sitting across the road on a short stone wall under a bit of shade. During the five minutes he was gone, a vendor pestered me nonstop trying to entice me into buying a straw hat. Saying "no" didn't send him on his way. Not wanting to be rude I ignored him. Tom returned, shooing him away as we commenced the long walk ahead of us to the restaurant. We trudged along. Upon entering Le Jardin for our final visit, there was no server or hostess in sight. We needed water and we needed it fast. There is no AC in any of the restaurants in the souks and although not as hot as in the sun, it was very warm. The heat in this sunny area of the Medina was a scorcher and has been so for the past few days as summer approaches. Finally, we spotted a server who scrambled to quickly bring our large bottle of "still" water. We both ordered filet Mignon this time specifying that I wanted the "monsieur's" size, not the women's usual "petite" size. Plus, we explained that each time we'd ordered steaks in their restaurant they were overcooked. This time, we also stressed to the broken-English-speaking server that my steak was to be bloody rare and Tom's pink at medium rare. We were thrilled when our mutually large steaks arrived 10 minutes later, cooked to perfection. We can't imagine that tourists would visit during the peak of summer, due to the heat. With our bellies full, we felt more prepared to tackle the return walk which based on our current location, only required a short distance directly in the heat of the sun. Returning by 6:30 pm, we were happy to be back in the riad in the salon sitting next to the fan with an icy mug of iced tea at our side. A short time later, my two sisters and niece together for a visit, called on Skype. Much to my delight, Skype was finally able to connect with a stronger signal for a fabulous chat. The signal was poor the previous night making it impossible to speak to my son and his family for more than a few minutes when they repeatedly tried calling to wish me Happy Mother's Day. This is the peculiar small door at Le Jardin. We had to not only duck our heads when entering or exiting but also step over a raised threshold. When exiting its imperative to check for speeding motorbikes and bicycles. Two days and counting until we leave Morocco. Most of my clothing is folded on the bed in my "dressing room" ready to be placed into the Space Bags after our last load of laundry is completed. Tomorrow, we'll post our total expenses for the two and a half months that we've spent in Marrakech, Morocco. Stop back for the tally! Not our photo. 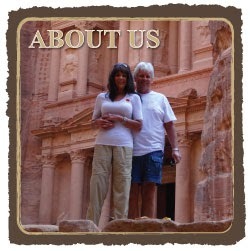 Tomorrow we'll share our amazing photos of Petra, the Lost City in Aqaba, Jordan. A person standing in the doorway of the Monastery at Petra, Jordan, shows the enormity of the ancient building's entrance. 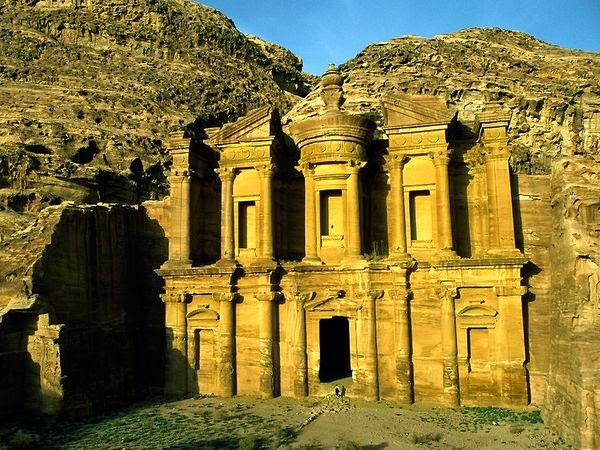 Carved into the sandstone hill by the Nabataeans in the second century A.D., this towering structure, called El-Deir, may have been used as a church or monastery by later societies, but likely began as a temple. We did not post a story that day since we were attending classes on the history of the Lost City.